The DROP is an evaluation kit that includes two different energy harvesting boards, a Solar board (SBN) and the Peltier board (PBN). 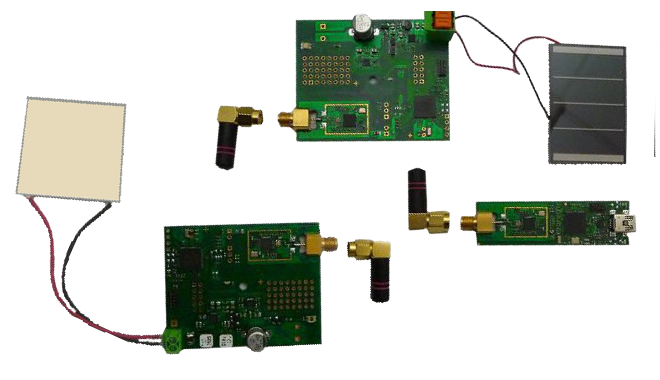 These boards are equipped with a 2.4GHz radio (802.15.4 ZigBee ready) that permit data transmission through the air. A third node (UBN), connected through the USB to a Windows PC, allow to receive all data sent by the other two harvestesting nodes. All these boards are developed using selected components from ATMEL and LINEAR TECHNOLOGY companies to demonstrate their low power consuption and their ability to harvest energy. The new "TheDrop Radio Kit" will be released in february 2012 and for this first step it will be distribute only by ARROW Italy. All documentation you find in this web site is totally free to dowload. You need only to register, it is free of charge. Since "TheDrop Radio Kit" is based on ATMEL and LINEAR development kits and ATMEL firmware, you must agree with all terms and conditions declared on the documentation of their respective development kits. ARROW is the distribuitor and the owner of The Drop Radio Kit so you must agree also with his Terms and Conditions.